Many poor people in the United States don't buy fresh fruits and vegetables because they are expensive relative to processed foods. I agree that a $1 hamburger will fill you up much more than a $1 apple (and, yes, they can cost that much). The issues of farm subsidies going to corn and meat versus healthy vegetables will not be solved on Snack Girl (not today at least :) BUT, the cheapest food you can buy in the U.S. is not meat. For a mere $1, you can get a POUND of dried beans. A pound of beans will serve 6 people. Yes, for less than 25 cents per serving, you can serve beans. And, if you combine beans with rice, you will get a complete protein the replaces meat and almost NO fat, a ton of fiber, vitamins, iron, etc. Most of the world subsists on beans and rice and it is really healthy and filling. You can make it tasty, too! Just figure out how you like your beans flavored and you can have many delicious meals for almost zero money. I like salsa on my beans and rice. I lived in the Mission district of San Francisco for years and was influenced by all my neighbors from Central and Latin America. A creamy luscious pinto bean and rice combination makes my heart pound with joy. How can you make cook beans so they will be delicious? My solution is the ubiquitous crock pot AKA slow cooker. The problem is that beans need to be stewed for a long time to make them edible. I don't have TIME to monitor a pot on my stove to ensure it doesn't boil over for 3 hours. The slow cooker's invention was inspired by the electric bean pot. This thing is MADE for cooking beans (along with pot roasts). It is so simple to soak your beans and then toss them in the slow cooker for a few hours. You can choose to season them with chiles, coffee, bay leaves, etc. My favorite book for bean cooking is the great, "Not Your Mother's Slow Cooker Cookbook" (see below - only $1.98 used). In it, they go through the best way to cook beans and the different times associated with the different varieties of beans: pinto, black, navy, black-eyed peas, lentils, chickpeas, etc. If you start making your own beans from dried beans, you will save A LOT of money over buying canned beans. $1 usually gets you a can of beans while 1 pound of beans is equivalent to about 4 cans. At this rate, you will pay for your slow cooker after you cook about 12 pounds of beans. The calorie amount above refers to 1/4 cup beans, 1/4 cup rice, and some salsa spooned on top. This is a fantastic healthy snack. 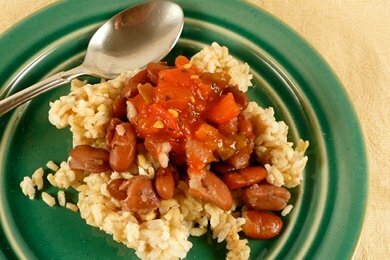 Have you tried rice and beans? What is your favorite way to eat them? I love beans so much! Mashed cannellini (white kidney) beans are an excellent high-fibre substitute for mashed potatoes, and they bulk out any soup or casserole so easily. I'm guilty of only buying canned, as my fiancé won't let me squeeze any more kitchen appliances into our tiny kitchen ;) but they're still very affordable. brown lentils simmered for 1 hour in plain water then processed to puree in blender(careful do in small batches) then thin with water and add a cup of leftover cooked rice salt and pepper=filling lentil/rice soup. I make dried beans in my pressure cooker. Works great at a fraction of the time. Excellent tips! I have tried to explain to a coworker time and time again that it's cheaper to cook whole foods than to eat out - and I try to explain that THIS is how. But alas, it falls on deaf ears. But I say to you to keep preaching this! I love beans and rice, and it can be SO tasty for so cheap! I found using dried beans completely intimidating until I bought a copy of "Not Your Mother's Slow Cooker". Now I cook with dried beans all the time with excellent results. Another note about the cookbook, it also has some great bean recipes that are simple and healthy. I would make beans, but my husband HATES the texture of them! Any ideas on how to disguise the texture? Beans are wonderful!! We eat them a couple of times a week. Chickpeas are my favorite. I really like lentils too. I have quite a few bean recipes over on my site. Check it out (click my name) for some new bean ideas. Also, one of my favorite cookbooks, The Daily Bean, even has dessert recipes with beans! I spotted this on one of my favourite blogs this morning - Carrots 'n' Cake - a recipe for Lentil Brownies! We eat TONS of beans since going "clean". I cook my beans at home almost all the time - way less sodium and chemicals than canned. I dont do it in a slow cooker. If I am going to be cooking with beans on a Wednesday I make sure to put the beans to soak in the fridge on Monday night. Then on Tuesday while I am making dinner I put the beans on to cook - they dont take any real watching - just let them cook. I drain and rinse them and put them back into the fridge for Wendesday's dinner. Or I will do a huge batch and freeze them in 1-1 1/2 cup portions, labled and dated. Saute onion and garlic, add two cups cooked beans, a cup to a cup and a half of frozen corn season how you want and there you have a yummy, quick, nutritious dinner. I like this with a piece of cheese on top. THANKS! my very most favorite healthy food is BEANS, I need my rice to be "fried rice" or "red" rice. not a rice fan, its gotta have flavor &/or veggies. I really like to make soups & one-dish meals. BEANS are a STAPLE! Also. Baby LIMA Beans are the best! I first tried them all by themselves when I was pregnant to up my Iron intake to combat anemia. LOVE LIMA BEANS! Don't know why they get a "bad rap". I don't have a crock pot and whenever I make them on the stovetop they are so mushy! How can I cook them to taste more firm, like a canned bean? Mine are either too hard or they are empty skins surrounded by mush! What type of bean holds it's shape while cooking best? Rice and beans are the main food here, in Brazil. Almost everybody eat this everyday (regardless of social position), with salad and some protein. I cook a large pot of beans , let cool when done, divide into container sizes that will feed 2 people, 4 people, etc, add just enough of the bean juice to cover the beans and freeze. When I want beans , I take them out , let them thaw alittle, or just put in a pan with a small amount of water and heat. They are great !